When I decided to go Vegan I also decided that I wouldn’t be eating the packaged Vegan food……..basically fake food. 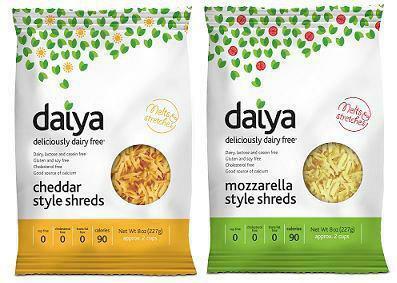 I did buy this…..Daiya Cheese after reading reviews on it that it was good. It’s not really that good. It tastes like a fake Kraft Processed Cheese slice……. I just came across the post below and found it very informative so had to share. My lesson from this…try to stick to whole foods in their natural form. Titanium Dioxide, ‘Natural Flavors’ and Daiya Cheese. Filtered water, tapioca flour, palm fruit oil, non-GMO expeller pressed canola and/or pressed safflower oil, pea protein, coconut oil, salt, inactive yeast, vegetable glycerin, xanthan gum, vegan natural flavors, gum arabic, lactic acid (vegan, for flavor), annatto, titanium dioxide, natural smoke flavor, vegan enzyme. All of their “flavors” of cheese have titanium dioxide, some have a few additional ingredients as well. One look at this label, even if you were unaware of the titanium dioxide dangers, would lead you to the conclusion that this is NOT food. For one thing, it is mostly oils, ALL of which are processed. And, we already know that eating processed oils is dangerous to our health. Palm Oil: Palm oil harvesting is not sustainable, and has been responsible for the destruction of rainforests, the massacre of thousands and thousands of orangutans, and the displacement of indigenous people. Additionally, the body has a difficult time digesting it. Natural Flavors: Any time you see “natural flavors” it is code for “chemicals we don’t want to disclose and we can get away with it because as long as they are chemically similar to their actual food replicas, we don’t have to disclose what we use. Toxic or not.” So the “vegan” tagline does nothing to help us out there. The definition of natural flavor under the Code of Federal Regulations (CFR) is: “the essential oil, oleoresin, essence or extractive, protein hydrolysate, distillate, or any product of roasting, heating or enzymolysis, which contains the flavoring constituents derived from a spice, fruit or fruit juice, vegetable or vegetable juice, edible yeast, herb, bark, bud, root, leaf or similar plant material, meat, seafood, poultry, eggs, dairy products, or fermentation products thereof, whose significant function in food is flavoring rather than nutritional” (21CFR101.22). Both artificial and natural flavors are made by “flavorists” in a lab by blending either natural chemicals or synthetic chemicals to create flavorings. The distinction between natural and artificial flavorings is based on the source of these often identical chemicals. Gum Arabic: A gum used in everything from a food stabilizer to inks and textiles. It comes from the hardened sap of the Acacia Senegal tree. It is used in soft drink syrups, gummy candies, and marshmallows, as well as inks, paints, glues, textiles and pharmaceuticals, cosmetics, photography, incense cones, shoe polish, postage stamps, cigarette paper adhesive, and pyrotechnic operations. And now we know, in Daiya ‘Cheese’. Natural Smoke Flavor: Smoke Flavor recipes vary, but typically include salt, sugar, sodium nitrate, propylene glycol, caramel color, natural hickory smoke flavor, a blend of natural spices and dextrose (GMO corn sugar) and in some cases, powdered tar, charcoal and ash. Enough said. Titanium Dioxide: It is a key ingredient in sunscreens. It’s also in Daiya Cheese. Titanium dioxide is classified by the International Agency for Research on Cancer (IARC) as a carcinogen. CosemticsDatabase.com also lists titanium dioxide as being linked to cancer, allergies, immunotoxicity and organ system toxicity, among other problems. It is also in many toothpastes. Remember, we are always just one label away from making safe food choices for our families and ourselves. When we are armed with the knowledge of what these ingredients are, we can take a look before purchasing these foods, to determine if they contain things we don’t want in our bodies, or our children’s. Yikes! As I often write on my own blog, with all respects to diets of any type, products such as these really should never use the word “cheese” unless they truly use dairy curd. Consumers and real cheese would be the better for it. Well, I am not eating any dairy so I thought I would try this. thumbs down on taste and ingredients….. If you think this is gross, wait’ll you try the other vegan cheeses! They are really all pretty bad, but you can make your own “cheesy sauce” from nuts and nutritional yeast that is pretty good. I don’t remember very well what cheese tastes like, but nutritional yeast is a decent alternative for certain flavors.